There is a large amount of evidence spanning over 30 years which proves many beneficial effects across a broad range of medical conditions. With regard to pain specifically, laser relieves pain by first blocking pain nerves and reducing inflammation in and around the painful area. Within 3-4 treatments better blood circulation, less inflammation and revitalised cells means your body can start to heal. Indeed some of the research shows this therapy is at least as effective as NSAIDS (anti-inflammatory drugs) with no side-effects. Low-level laser therapy is the use of laser to reduce pain and promote tissue healing. The laser used in this technique is applied to the skin without any burning or cutting. Low–level laser acts like a local anaesthetic which reduces the pain signals going to the brain. After a number of treatments the nerves in the affected area become less irritable and pain lessens. By blocking the pain over a period of time muscles in the affected area become more relaxed and tissues heal. As your pain is reduced you can become more active and natural healing progresses. Tender areas around the site of pain are treated. These areas are found by examining the painful area during each treatment. The laser probe is applied to the skin over tender areas which are treated for approximately 30 seconds/point. Total treatment time varies between 15 and 30 minutes. Does laser therapy cause any pain? 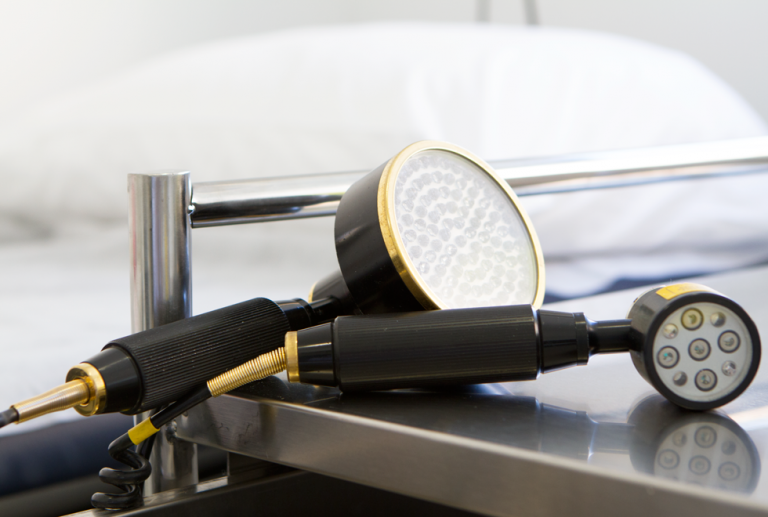 Laser treatment itself is painless and, there is often no sensation at all with the treatment. a “beep” every second that it is switched off at the probe. Most patients have no problems with the treatment. A small percentage of patients may feel tired, nauseated, or dizzy for a few hours following the treatment or may experience some worsening of pain for a day or so after the treatment. This usually passes without need for medication. Before and after each treatment we ask you to drink a glass of water as this will help minimise side effects. How often do I attend for treatment? Treatment is given either once or twice a week depending on the severity of the condition and the area needing treatment. The longer the pain has been present and the more severe the pain the more often treatment may need to be given. An average course of treatment is between 6 to 8 treatments. Some patients will have fewer treatments and others more depending on the severity of the condition or how wide spread the pain is. Avoiding known factors that can make the pain worse and resting the area will help speed up the treatment. The more quickly your pain improves the fewer the treatments needed and the greater the time between treatments. How quickly will I feel a benefit? Generally by the 4th treatment you will start to feel some benefit, though some patients do feel better after the first treatment. Do you have to do anything else during the course of treatment? resumed as your pain improves over the course of treatment. If possible it is helpful to apply hot packs after the treatment for a minimum of 15 minutes. This can be repeated as often as you can. You can continue with gentle physiotherapy and exercises though if these make the pain worse it is preferable to stop them altogether. Will I have to stop all my medicines? You may continue your pain medication during the treatment. As you respond to treatment, you may gradually reduce your pain medication from one treatment to the next. Prednisone may slow down your response to treatment but this often cannot be stopped. You will need to come for an initial assessment to see whether or not your condition is likely to respond the treatment. Not all painful conditions can be treated this way. Do I need a referral for this treatment? As this treatment is given in general practice you do not need a referral from your GP. Can I let my GP know what is happening? If you would like your general practitioner to know that you are having laser therapy, a letter will be written to her/him at the beginning of the course of treatment and she/he will be kept informed of your progress.